TNT/RDX with a steel lined shaped charge with 220 mm penetration of RHA. 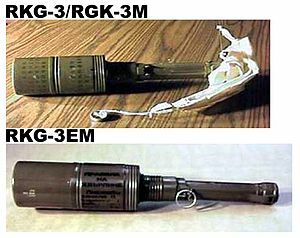 RKG stands for Ruchnaya Kumulyativnaya Granata ("handheld shaped-charge grenade"). The grenade has an odd strap-like lever (or "spoon") that covers the base of the handle and runs up each side of the handle. When the pin is pulled, the "spoon" falls away, and when the grenade is thrown a spring deploys a four-panelled drogue parachute. This parachute stabilizes the grenade in flight and ensures that the grenade strikes the target at a 90 degree angle, maximising the effect of the shaped charge. Realistic accurately thrown ranges are within 15 to 25 meters. The lethality radius is within 2 meters from concussion and fragmentation. The casualty radius is within 20 meters and the danger space from fragmentation is within 50 meters. The fuze in the handle activates the grenade. When the parachute deploys, its ejection throws a weight to the rear of the handle and disables the safety. When it impacts or stops, inertia causes the weight to fly forward and hit the spring-loaded firing pin, which activates the primer detonator in the base. This sets off the booster charge in the base of the shaped charge, detonating and enhancing the main charge. The sensitive fuze guarantees that the grenade will detonate if it impacts any target. Armour penetration depends on the model. The original RKG-3 used a basic shaped charge with a steel liner and had a penetration of 125 mm against Rolled Homogeneous Armor (RHA). The RKG-3M used a copper-lined shaped-charge warhead and had a penetration of 165 mm; the RKG-3T had an improved copper liner that had a penetration of 170 mm. The RKG-3EM has a larger warhead and boasts a penetration of 220 mm. The RKG-3 was adopted into service in 1950. A few years later it was replaced by the improved RKG-3M and enhanced RKG-3T. Thicker top armor caused the Soviets to develop the larger RKG-3EM. In early 1970s the Soviet Army replaced this grenade with the RPG-18, but many other countries and guerrilla movements are still using the RKG-3 in their armed forces. It was used extensively during the 1973 Yom Kippur War. Ulrike Meinhof was injured by an RKG-3 while training with the PLO in a Syrian training camp. RKG-3 grenades were widely used by Iraqi insurgents against American Humvees, Strykers and MRAPs. It is mentioned and featured in one of the scenes of the 2014 motion picture American Sniper. RKG-3M (-Modernizirovannaya, "Improved") Model with liner changed from steel to copper. Penetration : 165 mm RHA. Gross Weight: 1.1 kg. (2.42 lbs.) Copies manufactured by East Germany (RKG-3Cu). UPG-8 (Uechebnaya Protivotankovaya Granata, "Training Anti-Tank Grenade"). Black body with white markings. The reusable warhead contains a reloadable black powder charge that mostly produces black smoke that is vented through holes in the heavy-gauge sheet-metal. A new fuze and parachute can be quickly reloaded in the handle after use by using special armorer tools. ^ Ismay, John. "Insight Into How Insurgents Fought in Iraq". atwar.blogs.nytimes.com. The New York Times. Retrieved 7 April 2017. Hogg, Ian V. (1991). Jane's Infantry Weapons 1991-92. Jane's Information Group. ISBN 0-7106-0963-9. Jones, Richard D. (2005). Jane's Infantry Weapons 2005-2006. Jane's Information Group. This page was last edited on 22 February 2019, at 20:21 (UTC).